Great for All: Hertzko's Microfiber Pet Bath Towel is Great for Drying Dog or Cat Fur after Bath. Our Towels are manufactured with high quality microfiber material which makes it ultra-absorbent! It is able to soak up liquid 10x its weight! SUPER COMPACT & LIGHTWEIGHT FOR EASY PACKING - Great towel for traveling or to take along anywhere you might need a towel to comfort your pet. .
What is your risk? Nothing. If our Pet Towel is not everything that we say it is, and you're not completely satisfied with it within 30 days of purchase; we will refund every penny of your money, straight away. 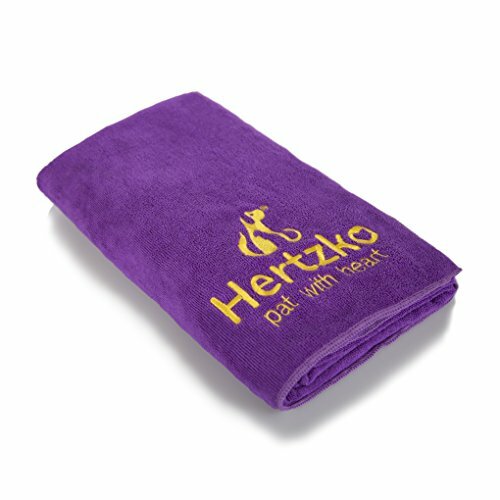 Get the Hertzko Microfiber Pet Towel today and you will not regret investing in high quality products. At Hertzko, Our products are protected by copyright and trademark laws under the U.S. and international law. All rights reserved. We stand behind our products with a 100% Satisfaction Guarantee ! ★ PERFECT PET TOWEL - Hertko's Microfiber Pet Towel is great for drying dog or cat fur after grooming or bathing. ★ ULTRA ABSORBENT- Hertzko's Pet Towels are manufactured with high quality ULTRA SOFT MICROFIBER MATERIAL which makes it ULTRA-ABSORBENT! It is able to soak up liquid 10x its weight! ★ SUPER COMPACT & LIGHTWEIGHT FOR EASY PACKING - Great towel for traveling or to take along anywhere you might need a towel to comfort your pet. ★ TOWEL DIMENSIONS - Our towel is 50"x30". Perfect size for dogs and cats of all sizes! ★ EASY CARE - Machine washable and quick dry. If you have any questions about this product by Hertzko, contact us by completing and submitting the form below. If you are looking for a specif part number, please include it with your message. YogaRat Mugzy's Mutt Towel: Awesome 100% Microfiber pet towel attracts but won't trap fur - 28" x 50"